Location - Our new retreat center upstairs at Lyons Quilting! In Kaffe Fassett's V&A book, Kaffe has taken a traditional lone star patchwork and made it fabulous simply by the use of colour. In his book Simple Shapes Spectacular Quilts, Kaffe took this further with the Not-so-lone Star. Quilts in America sees a fresh sunny version inspired by the antique Sunburst quilt at the American Museum in Britain. The Starburst Workshop is suitable for beginners who already know how to sew a seam and how to use a rotary cutter. It is also for more advanced quilt makers who wish to concentrate on complex colour development. Lunch, required design wall fabric, and a 25% coupon off of the price of one Kaffe Fassett book are included in your fee. Note that they have an awesome new book "Quilts in Cotswolds" coming out soon! Cancellation Policy - Please cancel at least 4 days prior to the workshop to give us time to fill your space. After that cutoff refunds will only be given if we can fill your space. 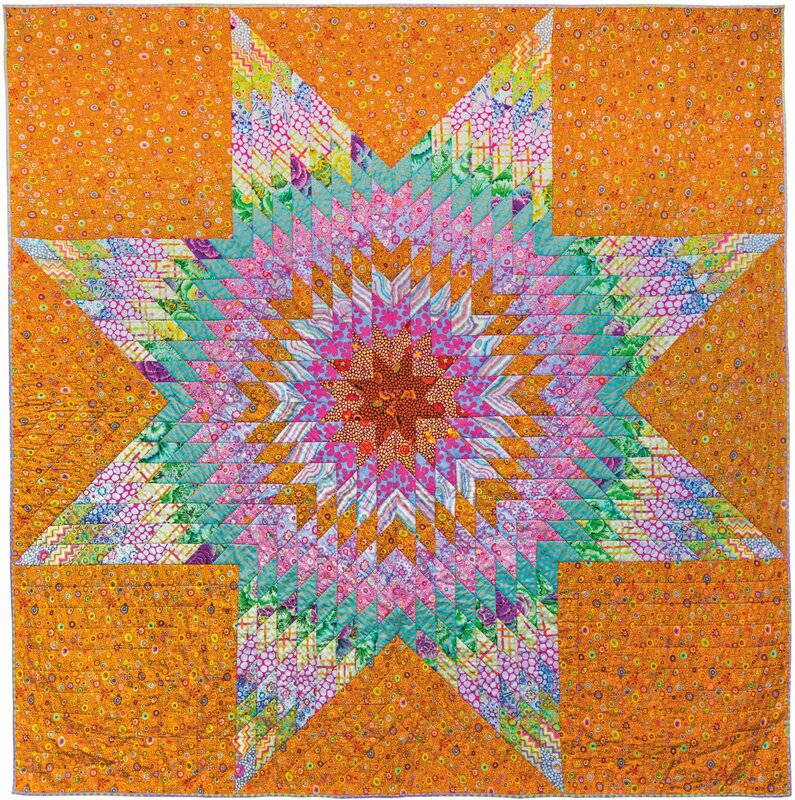 Starburst Quilt Workshop from Kaffe Fassett’s V&A Quilts. In ‘Kaffe Fassett’s V&A Quilts’ book, Kaffe has taken a traditional lone star patchwork and made it fabulous simply by the use of colour. In his book Simple Shapes Spectacular Quilts, Kaffe took this further with the Not-so-lone Star. Quilts in America sees a fresh sunny version inspired by the antique Sunburst quilt at the American Museum in Britain. The Starburst Workshop is suitable for beginners who already know how to sew a seam and how to use a rotary cutter. It is also for more advanced quilt makers who wish to concentrate on complex colour development. Copy of one of the following books: Kaffe Fassett’s V&A Quilts; Simple Shapes Spectacular Quilts; Quilts in Ireland; Quilts in Morocco. Kaffe wants you to choose YOUR OWN colour palette, so decide whether you want your palette cool or warm, pastel, jewel toned or dark and brooding. This is your quilt – your choice. Then choose a few fabrics in your chosen theme that you love and want to use. Also give some thought to the progression of colour and scale you would like to see emanate through your quilt. Bring ½ – ¾ yd/metre cuts of the few fabrics you have chosen. On the day of the workshop, you will be able to select from a whole range of fabrics through the host shop. Kaffe & Brandon will be able to assist participants in choosing fabrics to use in their quilt. Come to class prepared to try out several options for getting the radiating circle effect of the Starburst quilt. Do all of your cutting during the workshop - NOT BEFORE. Diamonds are cut from 2 ¾” strips. Fold the strip in half, cross cut at 45º and then cut pairs of diamonds at 2 ¾”. On the day you will have table space for cutting and wall space for laying out your quilt. Remember to bring ruler and rotary cutter. Please note there will be NO sewing in class so you can leave your machines at home! The class is focused on color and design! You will not need to bring cutting mats, irons, flannel design wall or lunch (unless you have a specific diet) - These will all be provided by Lyons Quilting!